You will be able to know Honor 10 Lite now official with Android 9 Pie and affordable price. Today we are here with Detail guide on Honor 10 Lite smartphone. Honor recently launched the flagship Honor Magic 2 smartphone with six cameras in China. Huawei’s Honor brand just announced Honor 10 Lite, the company’s latest mid-range smartphone in China. As seen in the teaser images, the Honor 10 Lite smartphone comes with a metal frame and curved glass body. The Honor 10 Lite will be available in Midnight Black, Gradient Blue, and Gradient Red color options. It newly comes with a 6.21-inch pearl display that sports U-shaped notch. The display on this device offers Full HD+ (2340 x 1080 pixels) resolution and 19.5:9 aspect ratio. The device comes with 4GB/6GB of RAM and 64GB/128GB of internal storage. There is also a MicroSD card slot for storage expansion up to 512GB. There are 12MP dual rear cameras with f/1.8 aperture, AIS, and auto scene detection. It sports 24MP selfie camera with f/2.0 aperture on the front and offers AI beauty mode and portrait lighting. On the rear, we can also sport a circular fingerprint sensor. Connectivity options include 4G VoLTE, Wi-Fi, Bluetooth 5.0, GPS, 3.5mm audio jack, and MicroUSB 2.0 port. This device comes with a 3,400 mAh battery. Honor is also offering eye protection mode that efficiently filters blue light. Under the hood is the Kirin 710 octa-core processor coupled with Mali-G51 MP4 GPU. About the pricing, the Honor 10 Lite with 4GB of RAM and 64GB of internal storage is priced at CNY 1399 (approx USD 200 / INR 14,350). The 6GB RAM variant with 64GB and 128GB of internal storage is priced at CNY 1699 and CNY 1899 respectively. 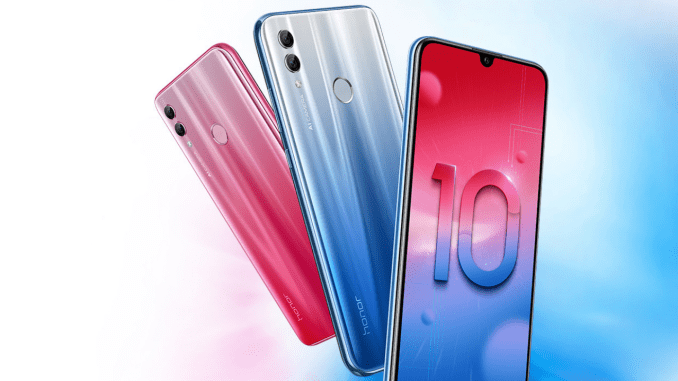 Article on Honor 10 Lite now official with Android 9 Pie and affordable price. If you have any problem then ask in the comment box. We can solve your problem.